A sugar estate worker is now dead after he was hit down by a speeding car on Saturday night on the Vergenoegen, East Bank Essequibo (EBE) public road. According to reports reaching Stabroek News, Ricky Narine, 50, of Philadelphia, also on EBE, was on his normal bicycle ride from his mosque to home when he was knocked down by a speeding car, which had struck a parked pick-up truck before hitting him. “Well we does do barbecue every Saturday night and he does usually come and leff he money and then go to Masjid and come back later for it and ride home,” one of the residents who lives where Narine was knocked down explained to Stabroek News yesterday. 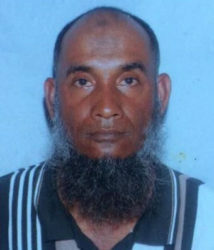 He said that while he was not present when the accident occurred, his pick-up truck that was parked outside was damaged at the back, indicating that the car had hit his truck first before hitting Narine off of his bicycle and escaping. Narine’s son Irshad explained that he had seen his father a few hours before his demise as he was preparing to go to Masjid. “You know is a normal thing that he does do every day so nobody didn’t think anything. Is when we get a call saying that he get knock down then we de know,” his son said. While the driver of the vehicle involved in the hit and run is still to be found, the accident occurred in the vicinity of a gas station and as such surveillance video was retrieved with the vehicle. Irshad explained that from what he saw the vehicle looked like a Toyota 212.